My journey into collecting dolls all started with a Cuddly Soft Kelly I gave to my Daughter. She just adored her new found friend, and carried her everywhere. Watching her travel to and from Grandma's house with her favorite doll, brought back memories of my childhood doll. After talking to my sister and my mom, and looking at old photographs, I realized she was a Mattel Tenderlove. In fact, my sister and I both had one, and we would carry them back and forth on the plane ride to our Grandma's house each summer. Once I knew who she was, I searched on eBay for a replacement of my long lost doll. I watched the Tenderlove auctions, and after sorting through the doll listing, I found a few auctions which looked promising. When the bidding was done, I ended up with my little girl, who I call Teia. While searching for my Tenderlove, Tippee Toes caught my eye. She was one of my sister's dolls, and I was on the hunt again for a piece of my childhood. While hunting for one doll, I continue to find others that enchant me. When my daughter started taking dance, a few old ballerina dolls caught my eye. Famililar dolls are comforting, new dolls are fun and exciting. My current favorites are Japanese dolls, Chinese dolls, 50s walker dolls and ballerinas, big toddler girls, and Brownie dolls. I am enchanted by the innocent faces of the dolls in my collection of Japanese children. These small 11.5 inch Japanese play dolls depict young Japanese children. They are sometimes called Yamato-ningyo or Ichimatsu dolls and celebrate the spirit of the Japanese child. These may be from the 1930's or 1940's and I believe they are wood composition dolls with a gofun (crushed oyster shell) finish. The hair seems real with even a few gray strands. Their kimono's seem to be a cotton or cotton blend and are hand stitched together. Their faces are just adorable! I have named these two Toshi and Yoshi. These were the very first Japanese Dolls I purchased. I was enchanted by their sweet innocent faces. Visit my Japanese Dolls page for more Japanese Dolls. This adorable 7 inch Chinese dolls depicts a young boy. His wood composition head, torso, arms, and legs are strung together with elastic bands. His hair are braids of black and red thread. He has a delicately painted face and red painted on shoes. I believe his machine stitched clothing are original. What an enchanting little boy! Visit my Chinese Dolls page for more Chinese Dolls. This adorable 7 inch Hawaii dolls is wearing two leis and a hula skirt. This 11 inch Hawaii dolls is wearing an original lei and a hula skirt. According to the Doll Reference site, Reliable Toy Company Limited of Toronto, Canada (1920-1991) were best known for their Canadian style Indians and Mounties. A similar doll on their site labeled "Indian Girl Doll or Hiawatha doll" is listed as from the 1950's. The pictured doll is faded. I named her River. 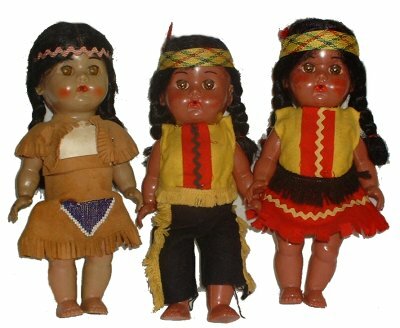 Click on her picture to see all three reliable hard plastic Native American dolls from my collection. They are all marked Reliable on their backs and jointed at the shoulder and hips. They all have brown sleep eyes and molded eyelashes. Their clothes are glued on. Raven and Eagle, are the names I have given the other two. I am charmed by their chubby cheeks and innocent looks! These Scottish dress dolls were manufactured by Roddy and are marked Roddy - Made In England on their backs. Dimples Walks was manufactured by Impco and is unmarked. I ID'd this gorgeous doll by comparing her against pictures of an original in box doll offered for sale on eBay. I believe that this sweet little girl is Rita. She came to me with missing eyelashes, and using an new black paint brush and some scotch tape I have relashed her. Not the most professional job, but enough to improve her outlook on life :-P Phew! 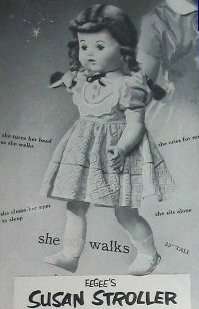 Saucy Walker was manufactured by Ideal and is marked IDEAL DOLL on the back of her neck and on her back. According to the Doll Reference site, she was from 1951-1955. She also can be distinguished from most look-a-likes by her flirty eyes, which move from side to side, and open and close. I purchased my TLC Saucy from eBay. She came with a hair cut, cracked side, and wonky eyes. She is wearing a wig for this picture, but I believe she originally came with 2 braided pigtails. Susan Stroller was manufactured by Eegee. According to the Doll Reference site, she was from 1953. I believe this doll is an unmarked Hard Face Susan Stroller doll. While her tummy grill resembles that of Saucy Walker, she came to me in this pink dress which resembles the dress seen in old Susan Stroller Advertisements. I believe this doll may be an unmarked Hard Face Susan Stroller doll. While her tummy grill resembles that of Saucy Walker, she looks similar very similar to the doll above. I believe her yellow dress is original. I call this cutie Sarah. I believe this doll may be an unmarked Hard Face Susan Stroller doll. She has a circular tummy grill and, she looks similar very similar to the dolls above. She is redressed in a cute sailor outfit. I call this cutie Sierra. Posie was manufactured by Ideal and is marked IDEAL DOLL VP-23 on the back of her neck and IDEAL DOLL her back. According to the Doll Reference site, she was manufactured between 1954-1956. She has a hard plastic body which is jointed at the neck, shoulders, hips, and knees. My Posie's vinyl face had darkened over time for a suntanned, island girl, look. Susan Stroller was manufactured by Eegee in the 50s. 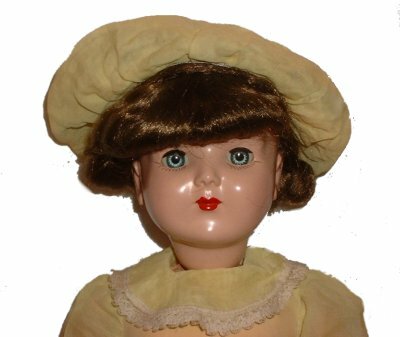 According to the Doll Reference site, the soft face version was from 1955. This doll is a straight leg, soft vinyl face version with auburn hair. She has sleep eyes, painted lower lashes and an open mouth. She is jointed at the neck, arms, and legs. She has a grill speaker on her tummy and still cries. She is a walker and her head turns when she walks. I believe her dress is original. 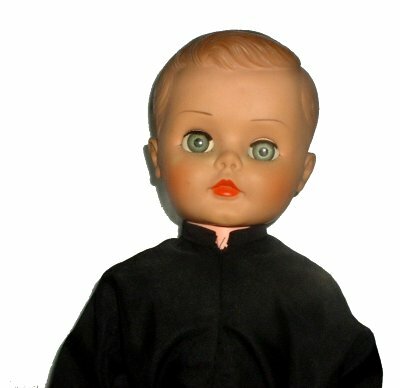 Wanda was manufactured in the mid 50s, according to the Doll Reference site. From the research I have done my doll is dressed in a yellow bridesmaid outfit. The bridesmaid dolls were exclusive to a high end department store and the dresses came in blue, pink, white and yellow. Connie was manufactured by Deluxe Reading in the 1950's according to The Deluxe Dollhouse (9/27/2004). She is hard plastic with a vinyl head. She is jointed at the neck, arms and legs. Her box said she was "JUST LIKE A 3 YEAR OLD" and she came with 4 complete playsets. While my Connie came to me in a vintage frock, she originally wore a blue dress with white pinnafore. My Connie is unmarked and before I found out who she was, I named her Dorothy after the sweet little heroine from the Wizard of Oz. When I first saw her, her small mouth and thin brown eyebrows reminded me of my Deluxe Reading Miss Beauty Parlor, so I was not surprised to find out that she was also manufactured by Deluxe Reading. I enjoy collecting these larger toddler dolls, and while a have serveral of them, I believe this is the oldest in my collection. I found a picture of a similar doll with this dress on in a different colorway at 50sdolls.com. The doll was featured on a pamphlet that stated "IMPORTANT: READ MESSAGE ON BACK HOW YOU RECIEVE THIS DOLL MADE OF UNBREAKABLE PLASTIC ON COLGATE'S NEW OFFER." So, I am assuming my doll was once recieved as a premium from Colgate. She is similar to generic Fortune/Virga dolls made in the 50s. This cute little girl has a button on her tummy that makes her shake her head no, and a botton on her back that makes her nod yes. Her hair still needs a little styling, but I took this pic inspite of her bad hair day. I love these chubby little Block Dolls, especially when they come styled with pigtails. This cute little girl has a homemade dress on. I have several Block Dolls in my collection including two are straight leg walkers and one is a bent knee walker. This 18 inch Doll is marked 14R. I think she was manufactured to compete with Miss Revlon dolls. Her head is vinyl, with rooted hair and her body is hard plastic. Aside from being jointed at the neck, shoulders and hips, she is also jointed at the knees and ankles. While there are many 14R dolls out there, I think the ones with the jointed ankles and knees are harder to find. This 18 inch Doll is unmarked. I think she has a sweet face. Her head is vinyl, with rooted hair and her body is hard plastic. Aside from being jointed at the neck, shoulders and hips, she is also jointed at the knees and ankles. She came to me undressed, but I found a cute little vintage nurse uniform on eBay and decided she needed a career change. I made her a nurse's hat out of white felt and tights from an old pair of ballet tights. Click on her photo to see a full body view. 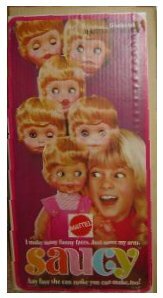 This 20 inch Chatty Cathy is from the 1960's and was manufactured by Mattel. She is referred to by some collectors as a "Prototype" because she is a first issue doll with no markings. The first issue dolls are jointed at the neck, arms, and legs, and have a soft vinyl face, blue decal eyes, and a cloth covered speaker. My Chatty is missing her pull string and her teeth, and has a faded face and lips, but I adore her. Her freckled face and innocent look has captured the heart of many collectors. I am totally guessing that this doll is from the 1960's and maybe manufactured by Deluxe Reading. He was a filthy mess when I recieved him, and in the process of cleaning him I broke his white paper collar. 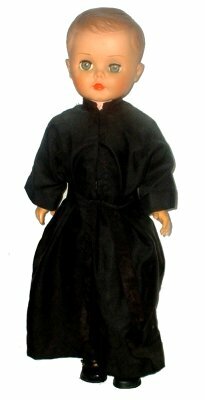 I remade him one out of felt, but for this picture he is missing part of his priestly vestments. Click on his picture for a full body photo. Little Miss Fashion is from the 1960's and was manufactured by Deluxe Reading. She came with 4 complete outfits. To see the outfits click on Little Miss Fashion. Little Miss Beauty Parlor was manufactured by Deluxe Reading and is from 1964 according to The Doll Reference (9/27/2004). She is jointed at the neck, arms, legs, and knees. She originally came in a playset that included a beauty parlor chair and various beauty parlor accessories. This was my first Deluxe Reading doll and I was impressed by her bendable knees, durable construction, and sweet face. I have named this little girl Paige. Pam is 8 inches and unmarked. From information found at 50sdolls.com I have identified her as a Fortune Pam by her molded shoes, peg arm attachment hooks, pale arms, and separate fingers. I found this gorgeous friend of Barbie's at the thrift store with a pair of turquoise glasses melted onto her face. I carefully peeled them off to reveal her cool rooted eyelashes. Because of the push botton on her back that moves her arms and legs I ID'd her as walking Jamie, a Sears exclusive released in the early 1970s. She is a cool and wonderful Mod doll! I dressed her in a modern Fashion Fever outfit. My sister's favorite Barbie, back in the day, was a Miss America Barbie, that was ordered off of a cereal box. My favorite was a Skipper doll. We had many cool accessories that I remember, including a United Airlines Airplane and Carousel Kitchen. While we have given away our original dolls long ago, I recently surprised my sister with this little beauty. This 16 inch doll was manufactured by Mattel and is marked MEXICO © 1967 MATTEL INC. It came with a horse and Trike. My sister had one of these dolls. My mother says that I broke my sisters Tippee Toes trike when I tried to ride it. I don't believe I would have EVER treated a doll item with such disreguard, not even as a toddler ;-). This 16 inch doll was manufactured by Mattel and is marked © 1969 MATTEL INC MEXICO. I had one of these dolls when I was about 3, but she is long gone. Her replacement, came to me without her original clothes and is redress in a homemade outfit I purchased on eBay. I named this doll Tea Tenderlove. This 16 inch doll was manufactured by Mattel and is marked © 1972 MATTEL INC MEXICO. She came to me with her original jumper socks and shoes. When you move her left arm, she changes expressions. Her box says "I make many funny faces. Just move my arm." I took her picture with my favorite funny expression: her crosseyed look.